Once again, the world oil market has failed to behave according to expectation. This time, the predictions of sharp price drops did not materialize-nor did previous forecasts of continuing escalation. This ongoing divergence between expectations and reality is becoming standard-as is the remarkable resiliency in the position and behavior of Saudi Arabia. Predictions that the constant-dollar price of oil will rise again to surpass and remain above the all-time peaks reached in 1981 rest on strong logical premises. The truism that natural resources are finite unites with the paradigms of Malthus, Ricardo, and Hotelling to imply that the terms of trade will forever flow in favor of resource owners, particularly the owners of depletable resources. There is a permanent surplus because huge low-cost reserves are available for development. The cartel keeps them undeveloped to maintain the price. Their power is great, but they are a "clumsy cartel" and sometimes overreact to produce a shortage. Hence the future is cloudy and threatening, like the recent past. Electricity demand in the United States declined in 1974 after over twenty years of sustained growth. By 1976, the growth rate was back up to 5 percent, but since then it has eroded steadily, with demand in 1982 slightly less than in 1981. This paper provides a simple way to understand these trends in electricity demand and to project futuredevelopments. Cost, duration, and other uncertainties of nuclear construction have recently been in the forefront of the news. Tales of mismanagement, inconsistent quality assurance, and utility financial woes have prompted many to ask why it takes so long and costs so much to build a nuclear power plant, and what the outlook is for plants currently under construction. For the last decade Canadian energy policy and oil pricing policy have been subjects of heated debate, dividing the country into several interest groups. The debate began when the federal government shielded the Canadian consumer from rapid world oil price increases by freezing domestic wellhead prices and subsidizing oil imports. This created a single price for oil across the entire country (except for transportation cost differences). The subsidy was to be paid by an export tax equivalent to the difference between domestic price and the world price. This policy was seen as an immediate response to a short-term problem: either world prices would return to lower levels or domestic prices could slowly adjust to the higher level without creating a price shock. Once a subsidy is established, however, it is hard to withdraw. Industries and consumers that rely on low-cost oil can be expected to lobby for continued subsidies. By observing real costs, moreover, the Canadian subsidy destroyed incentives to conserve costly fuels (e.g., imported oil). And there was no incentive to increase domestic production of such valuable commodities. By intervening, the federal government appeared to take on the responsibility of maintaining a status quo with respect to regional income distribution. Thus the scene was set. The disposition of offshore lands is one of the decade's most im-portant and controversial natural resource policy issues. Several disputes focus on the economic effects of federal Outer Continental Shelf (OCS) leasing policy. 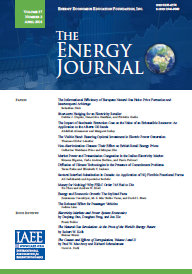 This paper addresses one of these disputes-how will OCSleasing policy affect the structure of the petroleum industry?This paper presents and summarizes an econometric model that evaluates the competitive implications of alternative OCS leasing policies.Specifically, it seeks to explain the differential bidding success of the major, minor, and independent oil companies.1 The following determinantsof OCS access were evaluated. Turbulent petroleum markets and poor economic performance have been making headlines for the last decade. Three major oil shocks (1973-1974, 1979, and 1980-1981) have each been followed by major recessions. While the magnitude and violence of recent oil price changes are unique in postwar experience, the phenomenon of political instability producing disruptions in petroleum supply is not. Hamilton (1983a) observed that all but one of the recessions in the United States since World War II were preceded-typically by about nine months-by a dramatic increase in the price of crude petroleum (see Figure 1). Under the provisions of the Natural Gas Policy Act of 1978 (NGPA), about 50 percent of natural gas production will be decontrolled in 1985. Whether natural gas is decontrolled under the provisions of NGPA or new decontrol legislation is enacted, real natural gas prices are likely to increase during the next few years. Rising natural gas prices will directly affect agriculture by increasing crop drying and irrigation costs. However, the largest effects will occur indirectly through increases in nitrogenous fertilizer prices; natural gas represents 60 to 70 percent of fertilizer production costs (Lutton and Andrilenas 1983). Because farm production expenses have increased nearly $100 billion from 1970 through 1981 (U.S. Department of Agriculture 1982b) and real farm income has decreased 70 percent during the same period, the decontrol of natural gas is viewed with concern by the agricultural community. Past and future electricity demand was analyzed for seven countries of West Africa: Ghana, Nigeria, Ivory Coast, Republic of Niger, Togo, Benin, and Burkina Faso (until recently Upper Volta). These countries constitute approximately 84 percent of the West African population. Primary energy resource endowments include agricultural waste, fossil fuels, hydra power, and some deposits of uranium (not uniformly distributed). Each country has some hydro power, with Nigeria having the largest resources. Deposits of crude oil have been discovered in most of the countries. Nigeria leads in known oil reserves and produces about 2.5 million barrels of oil a day. In contrast, Burkina Faso has very little available energy resources beyond a small hydro power potential. The world energy situation has been greatly influenced by the dramatic increase in world oil prices during the 1970s. To adjust to these increases, many countries have shifted to coal as a substitute for oil and have accelerated their research and development of renewable energy sources. Until nonconventional sources become widely available and economical, coal (along with nuclear power) will play a key role in the world's energy supply. Transportation and delivery, rather than production, pose the most difficult problems in meeting the greatly increased demand for coal. Studies concerning scale economies in the electric power industry have focused on a wide range of variables relevant to possible ways of increasing the nation's electricity generating capacity. In terms of scale economies per se, results from economic studies have supported current trends toward the construction of increasingly large generating units (Abdulkarim and Lucas 1977; Lomas 1952; and Ling 1964). Economies of scale for generating units and generating plants are attributed to such factors as nonproportionalities between plant capacity and site costs, lesser leakages and power losses obtained in larger generating units, operating and maintenance costs that increase less than proportionally with unit size, scale economies in coal-handling facilities, and economies in transmission (see particularly Lomas 1952; Ling 1964; Cicchetti, Gillen, and Smolansky 1977)) Ramifications of scale economies have been expanded to include such things as technological change (Barzel 1974, Dhrymes and Kurz 1964), interfuel substitutions (Atkinson and Halvorsen 1976) and regulatory aspects (Averch and Johnson 1962; Joskow 1974).